After renting a smart Car for a day and running it through its paces we have decided to write a little report about our findings. 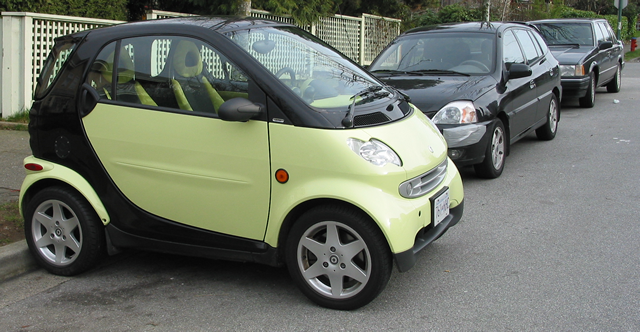 The smart we got for testing was a 2005 fortwo smart city coupe Pulse (The car we have ordered is the Passion model). The pulse was pretty much stock and in its exclusive green color. 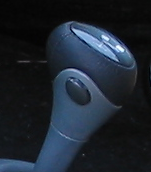 The only deviation from the stock car was the inclusion of the automatic computer-controlled soft touch mode. In automatic mode the car does the shifting automatically. Our testing day was perfect. Sunny in the morning, cloudy in the afternoon and rainy in the evening. We got to test the car in all of the common weather conditions this province has to offer. The two-seater is remarkably roomy for such a small car. Even my six-foot height and long legs were no problems in this car. I was able to adjust the seat to my perfect position and still had room to move back more. Visibility was quite good while driving with little to no blind spots once you got used to where to look. Because the car is only 8 feet long, it feels like you are surrounded by glass. 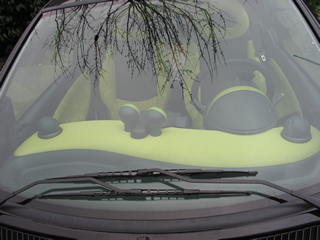 The mirrors were quite good in giving you unobstructed views around the perimeter of the vehicle. Driving the smart was extremely fun. It was an absolute breeze to switch lanes and weave through traffic. When in manual mode, I was amazed at how much power I could get out of the little 3 cylinder engine. I find it difficult to believe that it's only 40.2 hp. While stopped at a light a car that was behind me pulled into the right hand lane with the obvious intention to pass me. After having driven the car for only 15 minutes, I felt up to the challenge. When the light turned Green I went out of the gate in first gear, switching to second before the end of the intersection and blew by the car attempting to pass me. The other car thought they'd have an easy time passing us, but in the end it was them slamming on the brakes and signalling to enter the main lane, much to our amusement. I suppose our major concern was how the smart would handle itself on the highways and byways of the city and surrounding countryside. I must say I was pleasantly surprised with its performance. From 0 to 110kph it was rock solid. At 130kph it handled like my old '71 Ford Fiesta did at 100kph. That is to say, a bit twitchy in steering and the car bounced around a little. Nothing unmanageable or disconcerting, but in less than perfect weather I would slow down. As far as the smart and speed laws, it's more than adequate. Going up steeper grades on the highway did labour the engine a little, but it was still able to do 90 kph. For our day of testing, we did just over 200 km of mixed road conditions. The total gas used, approximately $6 (The car was not full when we got it, So we cannot give a more exact amount then that). 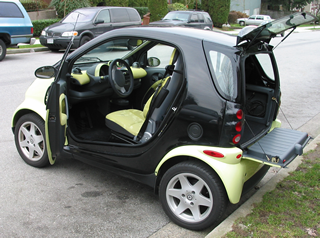 I've heard people complaining, mostly people that have never seen the car in person, that it has no cargo room. I can honestly say that it has a small car's trunk worth of space in the back. And with some of the optional cargo nets and other space organizers you can get an amazing amount of space in the back. 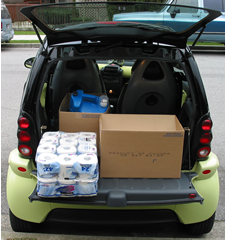 I absolutely love the tailgate on the smart. It's incredible useful and allows for a place to put items as you fit them in. The window hatch is also very welcome as it allows you to pile in items with the tailgate closed. The passion also comes with a cover to hide everything in the back. Good for keeping items from prying eyes. At 4.2L per 100km (62 miles to the gallon) it is a hands-down winner. Parking is a no-brainer with this car. Although parallel parking does take a bit of getting used to because of the tight turning radius. No key locks in doors. Some people might say this is a con, but I think it is great. There's no way to open this car without breaking a window or using the remote. 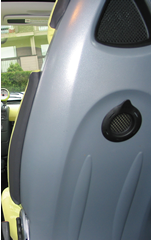 The rear hatch can also be opened via the remote. Very handy when your hands are full. The remote also works from up to 60 feet away! This is something I cannot understand. Basic adjustable seats have been around pretty much forever. My old Ford fiesta had what I would consider the bare minimum seats, but there was a lever to easily adjust the backrest to the appropriate level. On the smart driver side seat there is a flat knob on the right hand side of the back rest that you must rotate several times to move the backrest up or down. On the passenger side, you do not even have that ability! The chair is fixed in one position. Unfortunately this position is very uncomfortable for my back. The passenger chair can be folded down but I can't see how useful this is in real life. First off, in order to pull down the chair you have to take your left hand and pull the first lever back, then use your right hand to pull the second lever back and finally your third hand (a.k.a. head, shoulder or other body part) to nudge the chair back until it's past the locking point and then fold it down the rest of the way. The back of the chair is rounded, so nothing can sit on top of it without it rolling off with extreme ease. It is also quite a bit higher than the cargo compartment in the back. I believe it would've been far smarter to dispense with the folding chair and have a mirror image of the driver's chair instead. At least, this is what we are going to try to special order. If we can't, this could be a deal breaker. The soft touch automatic transmission mode. The computerized automatic mode (soft touch) is not as good as I was hoping. I get the feeling that it is shifting too early and loses power potential in the lower gears. It also has a noticeable lag between shifts. This can best be described by the feeling you would get if you rode a three stage rocket, the first stage has just ejected and you're waiting for the second stage to launch. It's that loss of acceleration, a pause and then the return of it. Also, the fact that you are not in control of when the gear is shifted tends to exaggerate the unpleasant feeling, due to the fact that you are not expecting it. I'm sure, in time, this feeling will lesson. The other slight annoyance with the soft touch is that if you put the car in neutral or reverse it kicks back into manual mode requiring you to press the button again to enter automatic mode. The other item missing from this car is power steering. 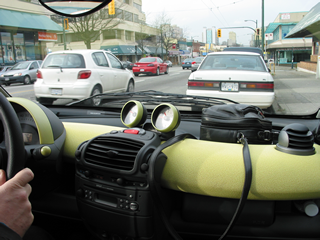 While not needed when the vehicle is moving more than 10 km an hour, for a person with chronic tendinitis in their hands and arms it can be a little annoying if the vehicle is stopped or moving very slowly. To be fair, this is more of a personal peeve and not really a car shortfall. 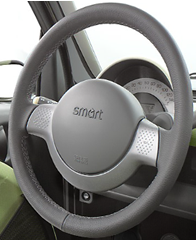 We just found out that the smart CAN in fact have power steering as an option! We have added it to our order. So the above no longer applies. Overall, it was a very enjoyable experience and that it is indeed, a fantastic car. We are checking into a few things but as it is now, this test drive has only made us want this car all the more! Return to our smart page!